I hadn't met Nev Wells in person; we grew to know one another through our blogs. Nev and his wife Rachel own NB Waterlilly. I found his blog as I searched the 'Net for single handed boaters back in late 2009. I was immediately captivated by his profile picture: Fradley Junction at sunset. It is beautiful and emotionally evocative--the kind of picture every good photographer wishes to take. As I read Nev's posts I was touched by his honesty and gentleness. I enjoyed his observations on life in general and people in particular. Every now and then I left comments to let Nev know his writing reached out and touched me all the way across the Atlantic Ocean. Nev knew Les in passing and followed his boat blog. When Les and I fell in love I wrote a blog about our story So this is Love. Nev began following, commenting as he read and our online friendship grew. 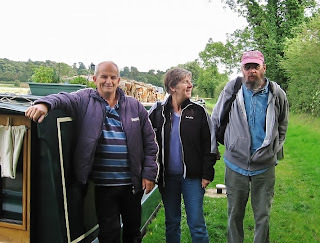 We missed meeting up as Les and I cruised North last March, so Dear Sir and I were thrilled to connect with Nev at last, inviting him and Rachel aboard NB Valerie. Nev came for coffee and carrot cake today and we had a great visit. We've both been employed in academia and have an understanding of university campus life; his wife is working on a Masters degree in Nursing--a difficult and sometimes grueling undertaking not for the faint of heart. She loves interacting with people and she's very good at what she does which is saving lives and helping people heal. I've several friends and acquaintances in the States who are also nurses and who teach for nursing programs. Nev and Rachel have traveled to the States so we share common ground there as well. 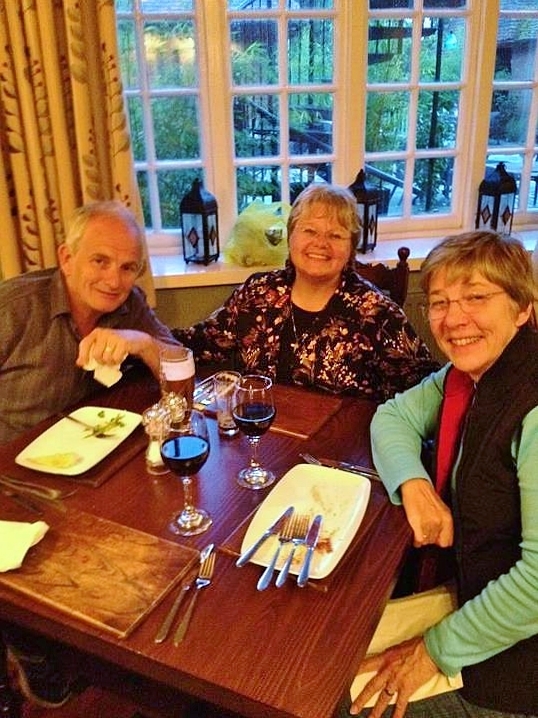 We had a lovely chinwag about living aboard and Les and I shared some anecdotes regarding our cultural differences. Nev in person is just as he is on his blog--honest, gentle, smart, funny, introspective. And I love his hair cut; I had one like it not too many years ago! Rachel couldn't come as she had exams for which to study but we sent Nev home with extra carrot cake to fuel her studying and we look forward to seeing them both some time in the future. To quote another boating friend named Mo, "Aren't boaters lovely?" Yes, yes they are; I am thankful for the welcome and acceptance I've received in this floating community along cut. 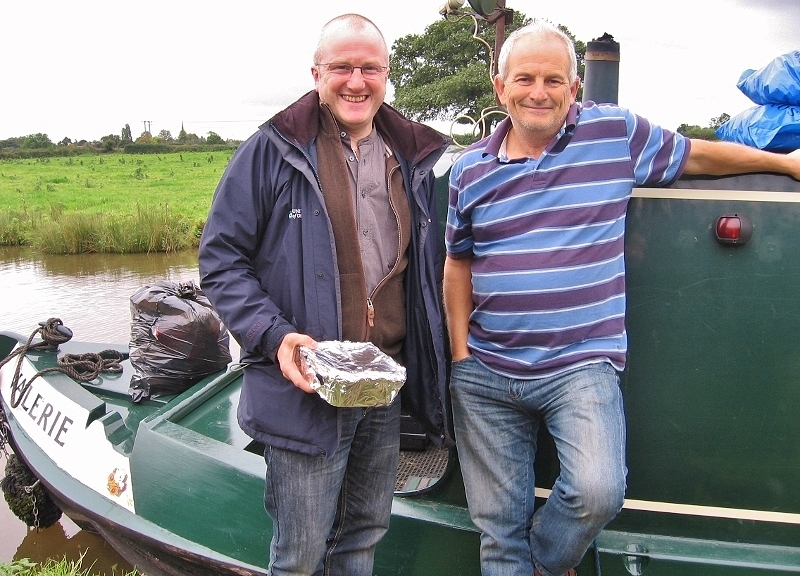 It is a unique fellowship with folks across a wide spectrum of employment, personal experience, lifestyles and cultures who all enjoy life with a narrow boat in it somewhere. We also share a deep appreciation for British canal engineering and the beauty, thrill, and privilege of traveling this country seeing the best of it in a manner that provides real opportunity to really take it all in and relish the moments, people, and places we experience; to breathe it in and make it a part of who we are--not just a person or place to be collected, categorized, photographed and forgotten in the pursuit of the next event. A lifetime of surviving out there in that other world left me stressed and clenched--body and soul--always waiting for the next crisis to strike. A year in England, married to Les and living aboard our boat has unclenched my fists and my spirit. I know happiness now in a way I've never experienced it previously. No longer a brief emotional state brought about by external happenstance, true happiness shines inside me like a light. It is the reflection of how I live my life each day, having found the place I belong at last, feeling extremely fortunate to share it with my very best friend. This life is so relaxing with no particular place to be at any given time unless of course you have yourselves committed to something. I have never in my life had a camera in my hand as much as in my time afloat. Thousands of pictures both sides of the pond have gathered on discs. Recently after taking 985 pictures off my laptop I had this idea to sort the discs into some kind of filing system. Should I sort them by canal, year, animal, vegetable or mineral. I could not decide and after the 3 days of them sitting on the table Jaq gently suggested it might be a winter project. Look at the picture right that is everything going back to 2006. Maybe i should start sorting them onto disc from now but how? Suggestions!!!! Anyway while looking through the 300 or more still on the lappie i decided to blog some. Every blogger must have the same problem of what to blog or more to the point which pictures to use. I can pick a disc from say 4 years ago and without captions after just a few pictures I can recall/re-live that year of cruising. Stone is a small town in Staffordshire on the Trent and Mersey canal. The picture shows almost the whole of the pedestrianised high street with perhaps a 100yards behind me. Just here in this one street there are 7 charity shops, U.S. readers know them as thrift shops. They are at least a good supply of books so I`m not complaining. Stone is said to have got it`s name from the pile of stones on the graves of King Wulfhere`s 2 sons back in 665AD. They died at the hands of their father following their conversion to Christianity.Religion and death still walking hand in hand 1347 years later........sad......when will we all learn. It`s hard enough at times living our own lives so why try and live life for others. The canal came through Stone in 1771 after Josiah Wedgwood and James Brindley signed a document that brought about the Trent and Mersey canal company. Brewing and shoe making were a big part of Stone`s history. The picture on the right shows our floating home going through Star lock. Jaq is at the tiller/helm while I am in charge of the lock gates. 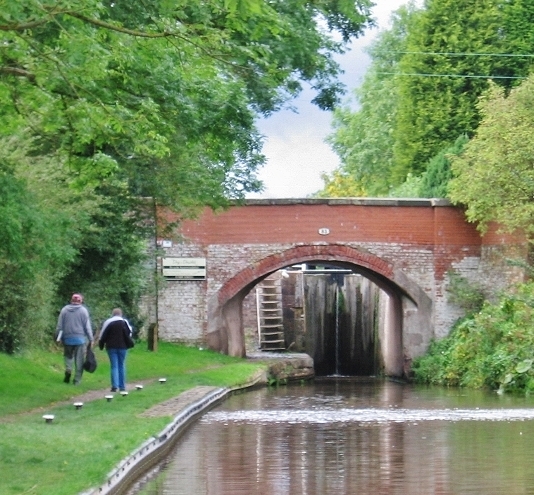 The lock is named after the pub and part of it was here long before the canal arrived. Leaving Stone we were on our way to meet Sally and Joe at Sandon so we spent a couple of nights at Burston a tiny hamlet, U.S. this is just a few residences, a short walk up from bridge 86. No shop and a half mile walk over the railway bridge to a pub on the main road. A lovely walk in search of a post box and a sit in the evening sunshine on one of many benches around the pond. I just love finding these little gems along the canal as we seek out the quieter moorings. Stone was ok for a couple of days to stock the cupboards but being moored in a long line of boats is not our thing. There is always so much between blogs that is never revealed. Those discs in the picture top of page contain hundreds of blog posts. A fairly recent un- published picture that might be a blog subject by Jaq sometime during the winter as she looks back on her new life afloat. It's a Bird, It's a Plane--No, it's a Balloon and there is an American on Board!! Last Saturday dawned clear and bright--the sun was out although the long term forecast indicated Britain would catch the tale end of hurricane weather--high winds and lashing rain to come. 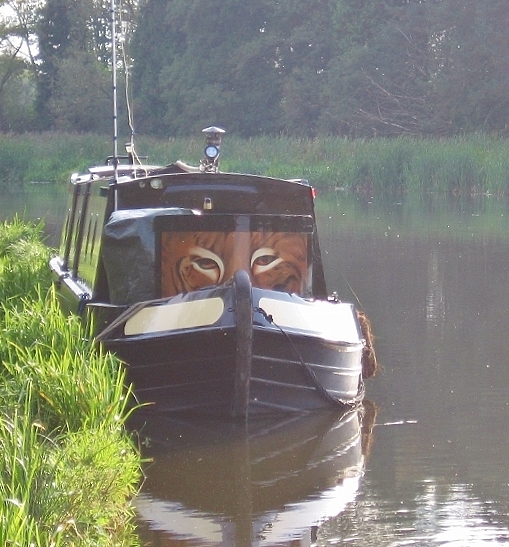 We made the most of the sunshine and cruised for a bit, filled up with water, dumped the rubbish, ran a load of laundry and finally moored up in a lovely, quiet spot. As we moored up I realised NB Bobcat was moored behind us! Finally after a year of passing each other with a wave and a smile on the cut, we had a chance to share a cup of tea, a piece of cake, and a good natter. Kath is a lovely woman. Short, shiny hair frames her fine face with sparkling eyes and a gorgeous smile. Kath's laugh is throaty and warm; she has many stories to tell of her life aboard NB Bobcat, and we enjoyed our chinwag. Settling in, we thrilled to two swans sharing a bit of towpath with a pair of ducks. A Heron flashed across the canal, wings spread wide, and a Kingfisher darted and weaved amongst the bushes near the water. Our spot on the canal appeared to be idyllic. As I began to consider what to fix for tea, a shout came from Les, who was outside setting up the satellite dish. "Balloons Jaq, come look--quickly, hot air balloons!" I looked out the hatch of NB Valerie and sure enough a large, multicolored hot air balloon was rising slowly above the meadow on the towpath side of our boat. Les dashed inside for his binoculars and I grabbed for my camera. He stood out on the towpath down by the hatch doors and I took up a position standing on the bow locker, arms propped on the boat roof, snapping pics. Ever so slowly the balloon rose with a large basket attached, holding a fair sized group of folks. Les had his binocs glued to his eye sockets, repeating rapturously, "Wow! Oh Wow lookatthat!!!!" 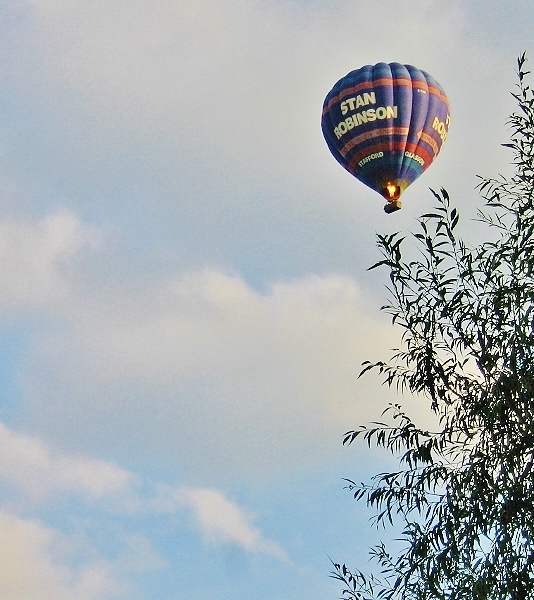 Suddenly another balloon rose on the far horizon of the meadow and began a slow ascent. As I snapped pictures Les danced around the towpath in rhapsody, switching his view from one balloon to the other. As the first balloon was almost directly overhead it fired up to gain height and I said "I wonder if the first balloon will follow this one." 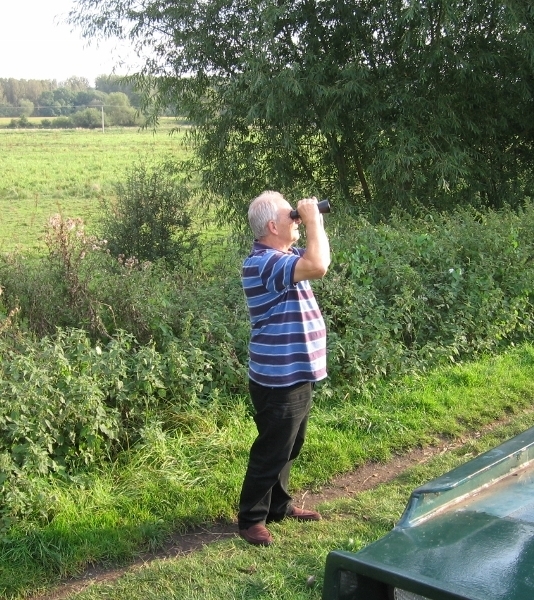 With his binoculars glued firmly to his face, Les said with utter amazement in his voice: "Jaq did you hear that? That balloon overhead is so close I can hear them talking. There must be an American on board, I'm sure I heard a voice say, 'I wonder if the first balloon will follow this one,'" affecting a flat, nasally American mid-western accent. Stunned, I looked down at my husband as he danced around the towpath in paroxysms of delight and wonder. "Les...Les...Les??? Honey that was me you just heard. I said I wonder if the first balloon will follow this one--and I did not say it like that" as I mimicked the flat, nasally mid-western tonality he gave his American balloonist. Les looked at me for a moment incredulously and we both burst into hysterical laughter, folded over, holding our sides. 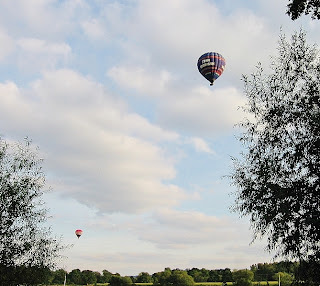 For an hour after both balloons disappeared across the cut I would mimic him and we would start laughing afresh. I spent the first 32 years of my life there! Reading the title of this post you might say "no way". Just recently i received an e mail from British Airways asking for me to sign a petition to stop the UK government increasing the APD Air Passenger Duty. We paid £65($98) each. Now looking at the rates chart on the left from the Customs and Excise site the mileages in the first column state that the 4799 miles to Seattle should be band C £81($121) but it appears the capital city of a country is used for calculating so Washington DC is 3670 miles band B. Surprised they didn`t charge per mile all the way. Anyway back to the `Air fares are cheap` title of this post. Our trip in November consists of five flights, 3 internal and the 2 across the pond. As you can see below the extras £377( $565) nothing to do with the airline, apart from fuel surcharge, add up to almost half the price of the flight. I suppose to be fair fuel price is out of the airlines control as much as the other charges. The total mileage of our trip is 8171 at a cost of £764($1146) each. Looking at this per mile it works out at 9.5pence(15cents) and you get fed. Just think if the taxes etc were zero this per mile cost would almost be halved. Now a train journey Crewe to London is 158 miles and the cheapest ticket as you see on the right is £26($39). 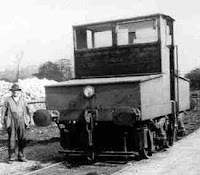 Now we have a price by train of 16.4 p(25cents) per mile and no food. So there you are cheaper by air. 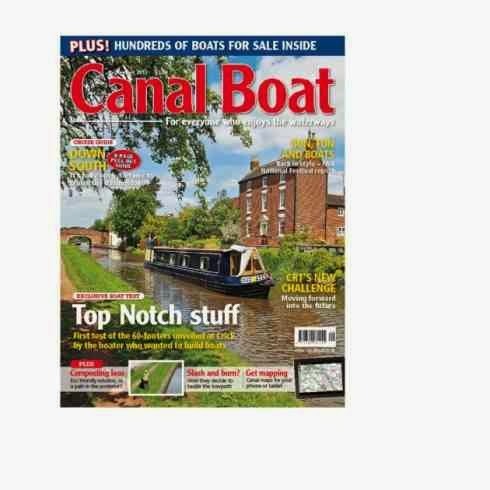 Just a bit of fun on a Sunday morning........just a thought but I wonder how much by narrow boat. Looking back at my post on fuel consumption my figures are £1.18 ($1.80) per hour. So very roughly at say 3.5 miles per hour the cost by boat is 33.71p (50cents). You must of course remember that includes our hot water and electricity generation and I get fed as we travel! As I said just a bit of fun but by all means comment if you want to, i`m all grown up and can take it. Today we exist in a moment of balance; night and day are of equal length. Tomorrow the days begin to shrink and the nights are longer than the days. 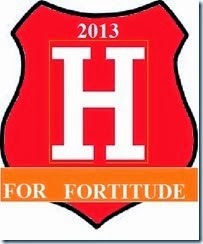 Thus the wheel of the year turns again, bringing the autumn harvest season to the top. This is a moment to stop, take stock of life, look inward, considering the blessings and challenges we've experienced on our life journey. It is time as well to consider what questions, challenges, issues, dreams, talents, loves, and desires we will choose to take with us into Winter's solitude to germinate in the darkness and bloom next spring. 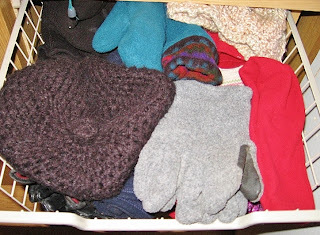 While Les walked up to the village of Weston for a Daily Mail weekend paper, I cleaned out the wardrobe. 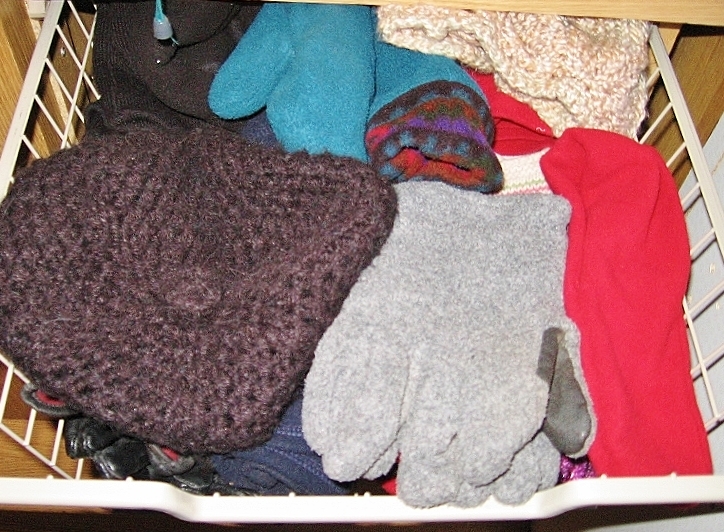 Folding and packing away our summer duds, I shook out our cold weather clothes and filled the cupboards and drawers with layers of warmth. We got under way, moving through a couple of locks, stopping at Great Haywood Marina for two bags of coal to see us through until the end of October. We meandered on down to Haywood Junction where Les suggested I visit the Canalside Farm Shop while he filled up with water, dumped the rubbish and emptied the loo cassettes. Off I went, expecting a small shed like place with a cold locker full of frozen meat cuts, some free range eggs, and a limited bit of fresh veg. Wow! What a surprise! I felt like a kid in a candy shop. I took my time, looking at all the delicious fresh cheese, fresh meat cuts, jams, candies, breads, a very good selection of veg; basket in hand I made my selections: two gammon steaks, a medium pork pie, a small bag of plain sea-salted crisps, a small cello bag of meringues, a pot of double cream and a punt of extremely fresh, just picked Stafford strawberries. We finished off the last of the pot of minestrone soup I made for Sally and Joe's visit last night. Les and I will celebrate this holyday (for witches anyway) with a lovely meal of sauteed gammon, egg, chips, and tea. For dessert we will enjoy strawberries in sherry with minted cream on top. Back on board with my treasures, we decided to turn right at Great Haywood Junction and moor up at Tixall Wide. A lovely spot was available near the widest part of the canal. 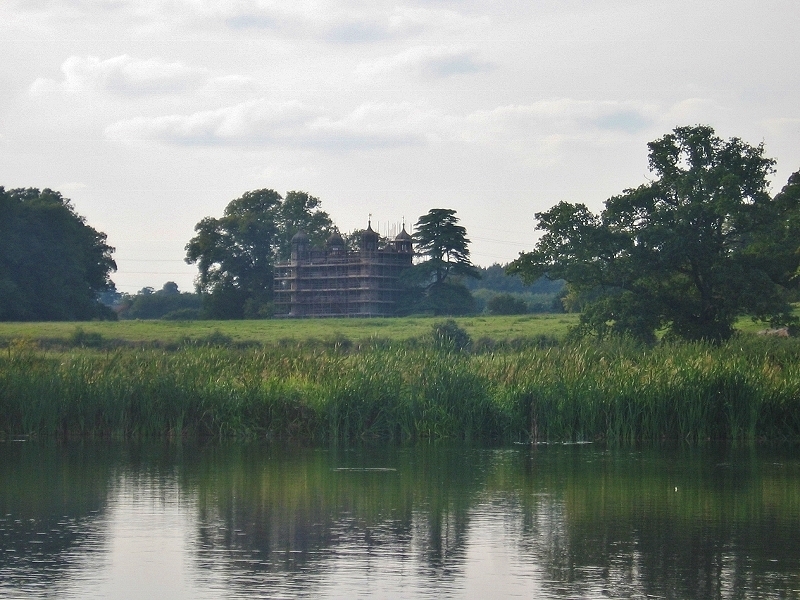 Tixall Wide is one of my favorite places on earth. 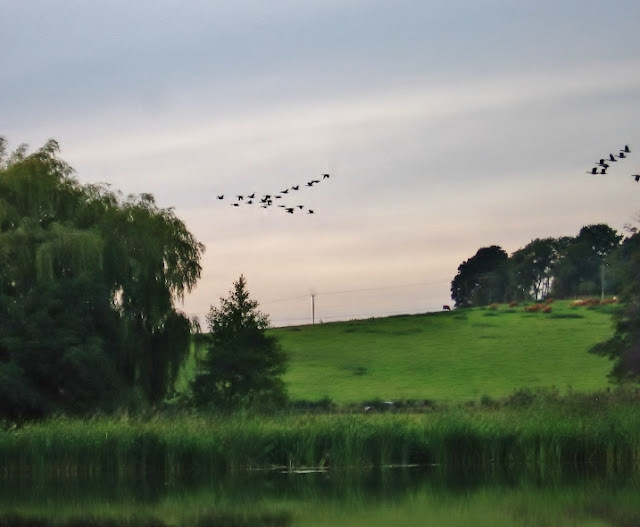 Martins dive and swoop across the wide, watery expanse, dragonflies dart amongst the tall grasses at the edge; cattle graze contentedly in nearby fields. Buzzards ride the thermals in the bright blue sky, the autumn sun cutting a shallower path across the clouds in the late afternoon. Fish barely break the surface of the water, bubbles giving them away as rings move outward toward the shallows. Oooh ahh missus--dodgy footprints has your Les and I'm watching him! On shore ducks lay in the grass sunning themselves. Two swans seem to be nesting--although it is too late in the season for it--just nearby. The male waddled down to inspect his new neighbors. This forty two pound bird hissed warningly at Les as he tried to leave the boat for an armload of firewood! 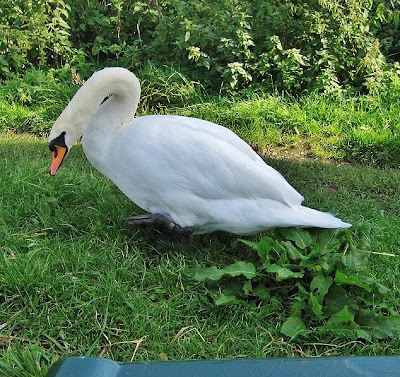 Deciding there was a need to surveil us closer, the cob chose to hang about the towpath at our bow, pulling in wads of grass with his beak through hisses and snorts, occasionally stretching his neck up and peering inside our boat. It is hard to believe but the weather forecast for the next few days is barely above freezing in places, rainy with high winds. In other words autumn storms a-comin'. I am thankful for this day drenched in sunshine as nature slows, stills, breathes in and exhales, preparing for the wheel to turn again toward winter--a time of reckoning, a time of limits. But for now we celebrate the ripeness of fruit, grain, and berry; the fullness of the harvest and the larder. There will never be more than there is right now--in this moment. She is a tree in a circle of stones. She is a crossroad at noon. She is the moon on the ripening grass. She is a hill on a night without stars. She is a tear of the sun. She is a hawk in the circling sky. She is the eye of the hound. She is a deer by the river of glass. She is a berry of red mountain ash. She is the seed of bright grasses. She is a stone in the river of glass. She is a sigh as time passes. Sally and I worked together at Washington State University for nearly a decade. I had the privilege of getting to know her through work at first. I appreciated her wry wit, ability to get right to the kernel of an issue without slogging through dozens of permutations beforehand, and her delicious laughter. Sally loves a good joke, and appreciates laughing at life's absurdities as I do. Scottish by birth, she knew what I meant when I would say, "Time for a cuppa." I love that she plays an annual game of Haggis Hunt online, for which she has even won a prize, and more amazingly in my book, Sally can cook Haggis! She arrived in the States in 1984 to study at University in Illinois. An invitation to a bar featuring Celtic music brought her into contact with Joe--a native of the flat landscape of Illinois--a lovely, kind, quiet, thoughtful man who shares Sally's wry wit. They fell in love and saw each other through advanced degrees, Joe's service in the military, and the birth of a son and daughter. She is a semi-retired academic who served as associate dean of her department, and he is a semi-retired licensed pilot and flight instructor, and both are great at telling stories, having lived interesting lives with lots of travel involved, with bi-national opinions on it all. Les and I have enjoyed fine meals cooked by Sally and Joe, who introduced us to the delights of Grand Seville Cocktails, espresso with a "wee dram" of Drambuie, and Joe's incredible home smoked Salmon and Steel head trout. Joe holds the mantle of making the best carrot cake I've eaten--hands down, no holes barred! When I was going through cancer treatment in 2008 I was searching out someplace locally in Pullman or Moscow, Idaho with sauna facilities. Those few I found required a membership to a club which was more expensive than I could afford. Sally found out about my search,. She and Joe kindly offered me the use of their dry sauna for as long as needed it. They blessed me with their generosity and kindness when I was feeling very vulnerable, walking through the world with my head up and my shoulders squared for a fight to win against that dreaded disease. When Les came into my life, Sally and Joe folded him into our friendship and we've dearly enjoyed spending time with them both. The Hortons travel back and forth over the pond because Sally has family and friends in England and Scotland, and they both love to travel. I was thrilled when Sally contacted me to say they would be in England in September and they wanted to visit--and "oh, by the way, can I bring you anything?" 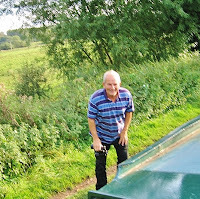 After emails back and forth, we agreed to meet in Sandon, on the Trent and Mersey canal. They booked a room at the Dog and Doublet Inn and we turned up on the boat, moored below Sandon lock and met up with Sally and Joe for drinks, catching up, laughter, and a yummy dinner at the Inn. 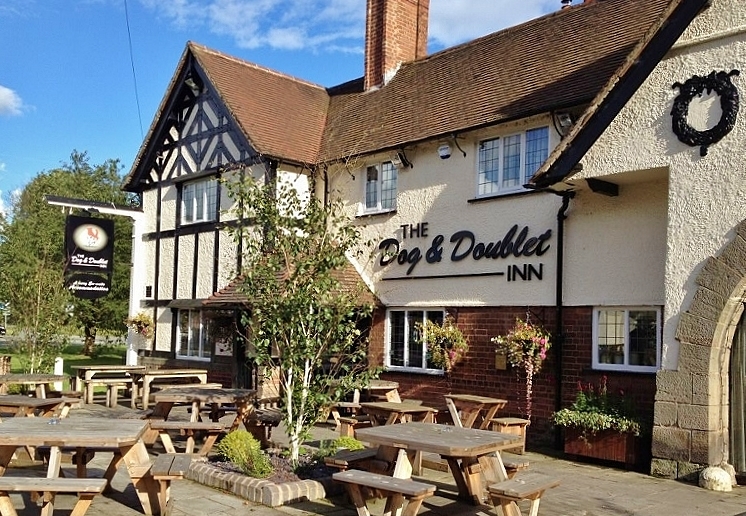 I encourage everyone who may pass Sandon on the T & M, to stop and enjoy a meal at the Dog and Doublet. You won't be disappointed. The next morning Sally and Joe turned up at the boat and we cruised for several hours--Joe on the stern with Les, talking about boaty things, while Sally and I sat on the bow and caught up with things happening at the University, mutual friends, and life in general. 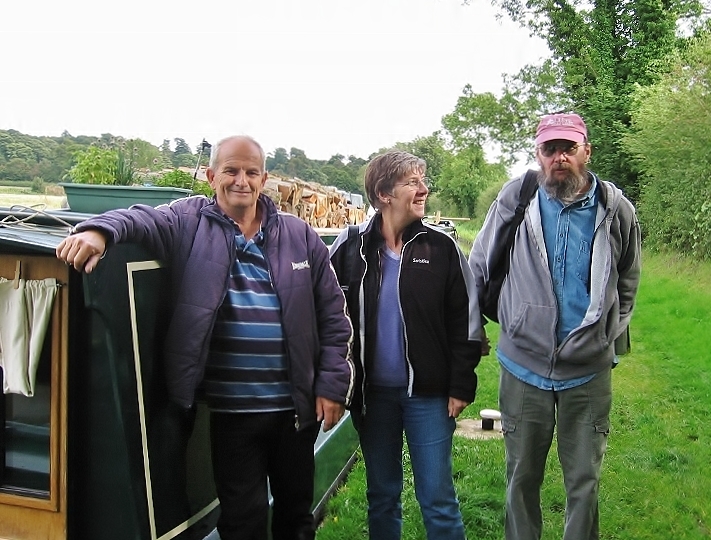 We enjoyed showing Sally and Joe how life aboard a narrow boat works for us, and they enjoyed the slow pace with an opportunity to really see the views along the canal. 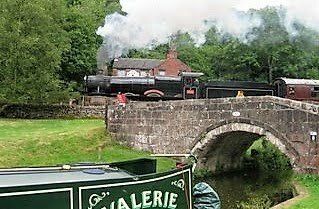 We went through Weston lock, winded, came back up the lock, found a quiet place to moor up and had a nice lunch of Minestrone soup and rolls. I had baked a small Blackberry Almond Bakewell Tart made with berries me and Les had gathered on Monday, and I also whipped up a Chocolate Kahlua cake, as Dear Sir was working his way through the Bakewell tart with gusto! Sally has been brought into the Chocolate Kahlua Cake tribe! After lunch we cruised back up to Sanson and said goodbye to our dear friends. Thank you Sally and Joe Horton, for spending a day with us aboard our floating home, and blessing is with your company. And Sally...thank you from the bottom of my heart for the Lipton's Onion Soup Mix, Beau Monde, and coarse ground cornmeal! A taste of the States from Sally's suitcase!! Safe journey back home to you both. We look forward to seeing you Stateside in November! The pictures below left show an area of the Caldon canal at Endon. Although about 5 miles out from Stoke on Trent there are pottery connections here. 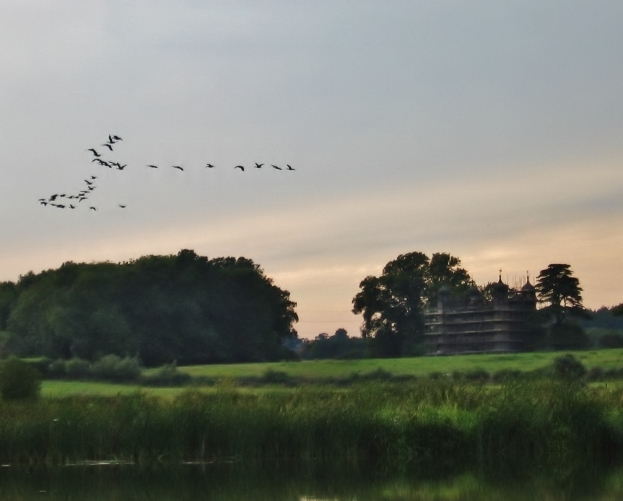 Looking below the `keep right` arrow on an island seems a strange site along a peaceful stretch of canal. The track from the Mill ran alongside the main line to Endon station. 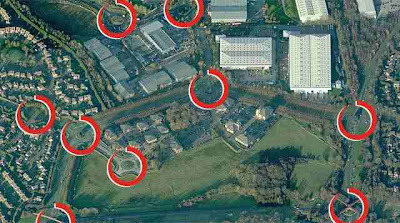 Looking at the picture below the track(main line) is still in amongst those trees to the left of the bridge. 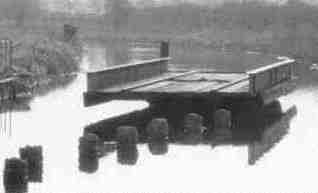 The arm appeared around 1903 to be used as a transhipment wharf between rail and water. Just one of many interesting shops in the town. Three days each week the restored Butter market opens for the indoor market. A small part of the market. This post box has lost it`s usual Red colour to honour Olympic Gold medal winner Anna Watkins a local lass. U.S readers this is a mail box that can be found in not just towns and villages but even in rural areas. This very evening I walked up from the canal and found a post box set in the wall of a barn in an area we call a Hamlet that consisted of a farm, a few houses and a pub set around a pond. Mail is not collected from outside homes as it is stateside. "Off with her head" said the Queen of Hearts in Alice in Wonderland. The Nicholson Institute built 1886 houses the library. Still used as a bank since 1883, the picture below is the doorway on the right. This 15C timber framed coaching Inn was built in 1626. Market place is the site of the outdoor market. Just a follow on to Jaq`s post on visual rhetoric the arrow means traffic runs in one direction only. Jaq says yes it means up in the sky. Jaq is amazed that this road in leek town centre was once open to traffic in both directions. We both think the driveway up to Chrisi Kincaid`s farm is wider than this. Visual Rhetoric--Welcome to My Classroom! This is a post I wrote for my ENGL 102 course which I instruct online for a stateside University, illustrating a few examples of visual rhetoric pulled directly from life experience. I've adapted it minimally for this blog. It is written tongue in cheek. Enjoy! Visual rhetoric is a form of communication that uses images to create meaning or construct an argument. Over here in Jolly Ole' as I refer to England, there are interesting and vast differences in spoken English grammar, usage, and rhetoric, from that which Americans are used to using. Driving provides several examples with a failure of the visual rhetoric implied--at least for this dyslexic American. After reading this I have no doubt all U.K. citizens will sigh gratefully and applaud my decision not to drive on their roads. In the States we have bright red stop signs at every intersection that does not sport a traffic light. Over here there are tons of signs along the carriageways as they refer to highways, but very few of them will tell you explicitly to STOP. Instead the instructions will be drawn on the tarmac (blacktop) in front of your car hood and it is up to you--the driver--to see them, correctly interpret the symbols and react appropriately to the solid lines, solid double lines, dotted lines, half dotted lines, etc. on which your life and those sharing the highway with you, will depend--which is one reason why I will never seek a driver's license in the U.K.
By the time I spotted the drawings on the road ahead of me (assuming there are no cars in front of me blocking my view of the tarmac/blacktop) and figured out what they meant and what I was expected to do--it would all be over in an accident. When driving in the USA one often sees a bright yellow triangular sign with words in bold black letters saying YIELD. This sign is an explicit instruction leaving no doubt in a driver's mind what one is being told to do. And it only takes one word. In England, Scotland and Wales they do not have yield signs Per Se; they have triangular white signs with red borders asking one to Give Way. Really? Now to me that is so darned polite. It suggests that I might wish to slow down and allow someone else a chance to go....or maybe not. Another very odd thing about driving in the U.K. are the traffic lights. Whenever possible they get around having any traffic lights by doing away with intersections. Instead they have round-abouts. Some of the round-abouts are HUGE, with twelve lanes merging into a merry-go-round of ever flowing traffic. A couple truly stupendously, enormous round-abouts have miniature round-abouts in each lane. This is the other reason why I will never seek a driver's license in the U.K. Yet when Brits due opt for the use of traffic lights it is not enough to have one set of lights to which all lanes respond appropriately--no; each lane may well have multiple sets of lights! The following link takes you to a picture of a London bus waiting at an intersection. It has three lights telling it what to do and which direction to travel! Last summer my very British husband and I moored up our floating home at Fenny Stratford on the Grand Union Canal. We walked about fifteen blocks to IKEA to buy new chairs. We don't own a car and we use what is euphemistically referred to as "Shank's pony" to get around. That means we walk. As we approached a winding curve of no less than five lanes intersecting, my husband Les grabbed my hand tightly, looked both ways and then yelled frantically, "RUN!" Run we did. Now imagine this scenario on our way back to the boat two hours later with two large, flat packed chairs in boxes, stacked in a shopping trolley (grocery cart). Les' head swiveled in both directions and he heaved the trolley off the curb yelling "RUN!" And we did it again, the trolley with its heavy contents bumping across the lanes as cars approached at high speed with no intent of slowing down. Why, one might ask, would anyone cross a busy highway like that? Well because over here in Britain there are very few pedestrian crossings, unlike Stateside where every blacktopped road will have one. Very few...occasionally we have come across them and they are called Zebra Crossings! This is pronounced with a short e as in the name Ed: ze-brah, not zee-bra. And why one might ask, are pedestrian crossings called this? Because of the thick white lines painted on the black background! Well duh! Why call something a name which indicates the reason for its existence when one can refer to it by the way it appears, using visual simile to compare it to an African animal completely unrelated to its use. But there ya' go--that's Britain for you. Now whenever I see a Zebra Crossing sign I fall into a fit of cackling laughter, bent over at the waist, with a picture in my mind of a herd of black and white striped horses waiting to cross the road. Astonished Brits give me the hairy eyeball, assuming I'm suffering from Tourette's syndrome or having a stroke. And the sign reading "Humped Zebra Crossing" sometimes makes me laugh so hard I need to cross my legs and find the nearest public facilities. My husband and I often have odd little "cultural" moments as we call them, when we are speaking to each other presumably both in English and then we stop and eye each other in silence--me thinking, "What in the world did he just say?" Les is thinking, "Speak English woman!" A fine example of this is illustrated beautifully in a recent Enterprise rental car advert. Every time it comes on the telly we dissolve into laughter because it is so evocative of us. This ad uses the obvious differences between Britain and America in how we drive, where we sit to drive, how we pronounce words, and overall how differently we behave to indicate that no matter the differences between our two countries, Enterprise car hire (car rental) will get you where you want to go--with humour (humor). Interestingly enough, The Drum staff writer who covered the ad in this link felt it didn't give him any specifics on why he should use Enterprise car rental, basically stating that the visual rhetoric of the advert didn't make a strong or clear enough argument for using Enterprise. I figure he just didn't have a sense of humor. I Give You--Our finished Remodeling! !